At the beginning of February 2019 Westminster Council approved plans by Shiva Hotels to demolish Welbeck Street car park as part of a new 10-storey hotel scheme for the site. Shiva Hotels purchased the land in 2016 for £100 million and initially received permission to redevelop the site in 2017. But after changing architects, a revised scheme was submitted and unfortunately still received approval to completely demolish the existing car park. Losing this building will be a very sad story for all of us who enjoy and are inspired by Modernist and Brutalist architecture. Welbeck Street car park is a classic brutalist building and one of the most iconic car park structures in Britain. It stands bold and uncompromising occupying a plot facing onto Welbeck Street, Henrietta Place and Marylebone Lane in the City of Westminster. The exposed concrete facades are refined and grotesque all at once; typical of the architectural style that champions the aesthetic value of structural materials. It was designed and built in an era when British architecture took a firm stance against previous design styles, deemed too ostentatious and meaningless by architects of the time. In a context of new urban and highway planning as a response to the increasing use of cars this was a no nonsense architecture that offered beauty through expressing raw truth and functionality. Welbeck Street car park was commissioned as part of a new flagship Debenhams Department store on Oxford Street in the 1960’s. Planning policy at the time required large shopping stores to provide parking facilities and so a design brief was created for a multi-storey car park that included 400 parking spaces, department store storage facilities, and ground floor lettable space. The commission was won by Michael Blampied and Partners; a London based architectural practice set up by British architect Michael Blampied. They were a commercial and residential practice and had good experience in delivering highway infrastructure projects. The rationale behind the design is clever and justified. 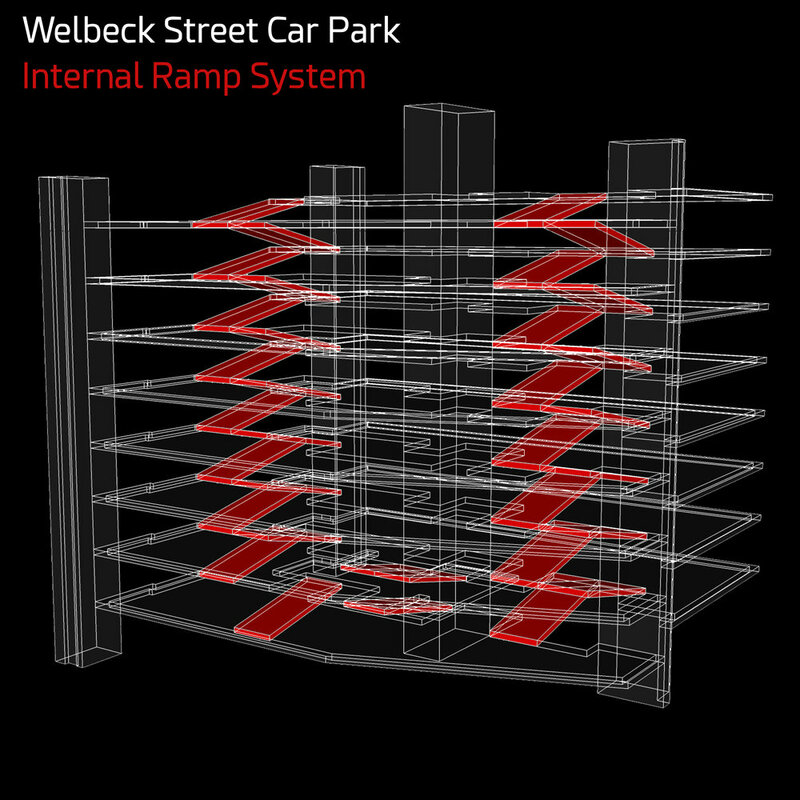 Due to the compact nature of the site an external ramp system would have taken up too much space – significantly reducing parking spaces – and so an internal ramp system was designed. The ramps run adjacent to the parking bays to maintain a regular grid for setting out the spaces. A split level floorplan is then proposed to shorten the ramp lengths so that they can be located in the middle of the car park. This also sets up a centralised circulation and structural system created by the lift and stair cores. Whilst it is the strong tessellated geometric facade that proves the most striking feature of Welbeck Street car park the ingenuity of the architects means this is not only an aesthetic device. The tessellated prefabricated concrete modules are load bearing; supporting the reinforced beam and plank parking decks from the external edge, and with the central lift and stair core for internal support this leaves the internal space free of columns with clear lines of sight for easier manoeuvring. Although this structural system was originally pioneered by Seifert and Partners (as can be seen in his Centre Point Tower and Space House, both also in London), the faceted geometry adds an extra level of complexity that sets the facade apart. Through a series of full scale polystyrene mock-ups the design of the modules was developed to dispel rainwater efficiently to reduce water staining on the pale Irish Millwhite aggregate concrete. The car park has been underused since opening, primarily due to the preference for on street parking. The lack of a reservoir or feeder lane into the car park would however have proved problematic for traffic in the area had the level of use increased. Over the years, the lettable units at the base of the car park have served a multitude of purposes, from initially including large refrigerated units for storing furs, to as recently as 2011 opening as a restaurant. Sadly, as of August 2017, Welbeck Street Car Park was condemned to join the growing list of stunning British brutalist buildings to be demolished. Its fate sealed by Historic Englands failure to register it as a listed building and Westminister Council approving planning for a Hotel which is to replace it. 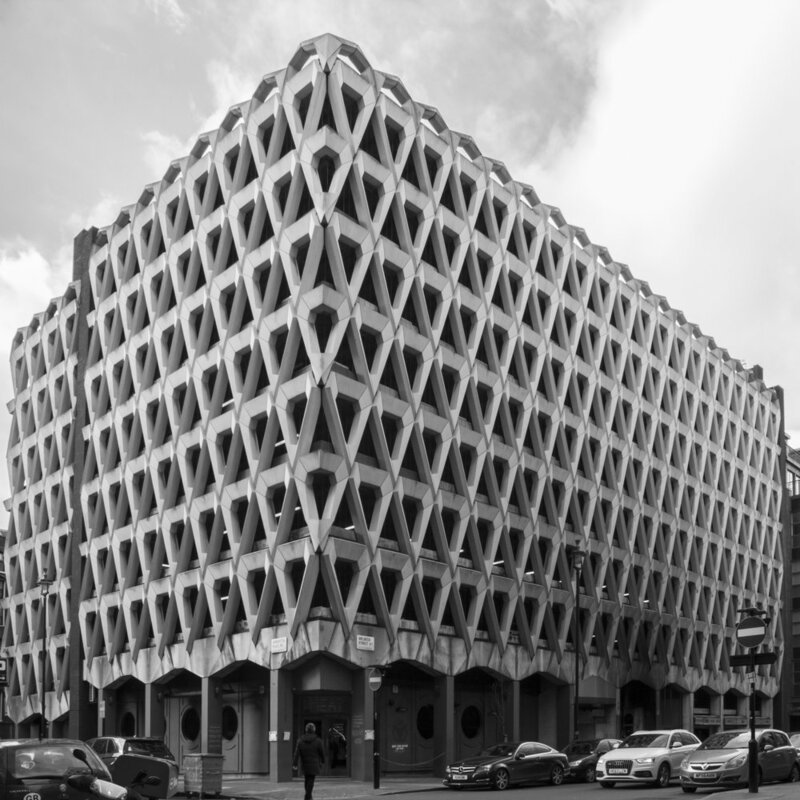 "While the car park on Welbeck Street stands out nationally as an exemplar of 1960s car parks, it does not meet the very high bar for listing buildings of this date," said a spokesperson for Historic England. "It does not compare well with more striking and slightly earlier commercial buildings in the Pop Art movement from which it derives," they continued. "The car park is not innovatory in terms of its structure and also exhibits flaws in its design." The flaws in the design being referred to are likely the ground level arcade; the decision paper stating it compromises the building as a whole and does not display the same 'refinement in the design' as the tessellating geometric facades. Over the last few years, there have been a number of speculative schemes that have appreciated the architectural merit and beauty of Welbeck Street Car Park, and have looked to preserve it for future generations to celebrate and experience great Brutalist architecture. This includes architectural firm JAA's proposal to accommodate a hotel within the existing structure. "We have always admired the pre-fab concrete facade of Welbeck Street Car Park. It immediately stops you in your tracks and lifts the spirits," said founder Jenny Fleming. It was argued the 2.1m ceiling heights made adaptive re-use for the structure impossible, but JAA's scheme fully accounted for this, arranging new floor levels suited to hotel use set behind the existing facade, as well as adding an additional three storeys to the top of the structure. Westminster Council and Historic England's failure to preserve this fantastic piece of British brutalist architecture has been met largely with a sense of dismay, frustration and ultimately sadness- sensing the loss this short cited and brash decision is to Britain's architectural history and heritage. Our studies and drawings of Welbeck Street car park have formed an investigation into the design and layout of the building. Through this investigation we have drawn and replicated parts of the building with have translated into a range of mini artwork pieces that represent different aspects of the building. Our first piece translated into an elevation study using lasercut layers to portray the southern elevation. This piece shows how the split floor levels are expressed within the tessellated façade and how the differing levels are cleverly resolved by partially exposing the stair core to create a clean break in the external pattern. Using computer software we have modelled the building in several ways to create physical 3D representations of the building. More artwork has been created using concrete casting to portray the overall form of the building in our mini 3D model, and a 3D facade study showing the tessellated diamonds has also been used to create a scale elevation in cast concrete. It can be argued, due to the combined freedom and technical innovation available to architects during the brutalist period of the 1960’s and 1970’s, that there was a pinnacle of architecture at this time. It was an era when designers had the opportunity to indulge in a raw creative expression, and to push for a pure architecture that was a mastery of form. Welbeck Street seems to be a proof of this and it is such a privilege to witness these icons first hand. Like a rare celestial occurrence - it came, will perhaps very soon, be gone. But we were all present to witness its existence and can tell others about this in the future. We plan to appreciate and enjoy the presence of Welbeck Street car park for as long as it is still here and I hope you all get to see it before it disappears.